Venerable Bhikshuni Tenzin Kacho is an American Buddhist nun in the Tibetan tradition. Tenzin has been a student of Buddhism since 1971 and wanting to pursue her studies more fully, was ordained by His Holiness the Dalai Lama in 1985. The main teachers for Tenzin have been His Holiness the Dalai Lama, Ven. Kyabje Ling Rinpoche, Ven. Geshe Tsultim Gyeltsen, Ven. Geshe Ngawang Dhargye and Ven. Geshe Sonam Rinchen. She has been living and studying in Los Angeles, California under the direction of Ven. Geshe Tsultim Gyeltsen, Spiritual Director of Thubten Shedrup Ling in Colorado Springs and Thubten Dhargye Ling in Los Angeles. 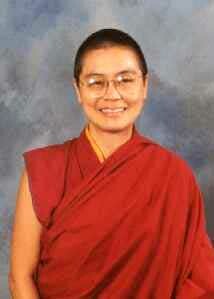 Tenzin-la has been a resident teacher in Colorado Springs since September 1998. In the first year she presented lam rim teachings and conducted some wonderful guided meditations and weekend retreats. During her second year she led a three month intensive meditation class on "Death and Impermanence" and encouraged many students to intensify their practice. This year, Tenzin-la received a full Monastic scholarship to attend Naropa University in Boulder, Colorado. Her focus is primarily on developing her skills as a teacher, so she will continue teaching at TSL while commuting to Naropa as a part-time student. We are extremely grateful that she has chosen to be with us and look forward to having her continue to be our spiritual teacher and friend for many years to come.